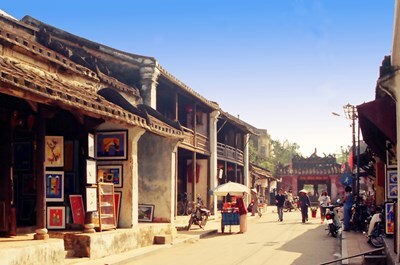 Hội An, also Faifo, is a city of Vietnam, on the coast of the South China Sea in the South Central Coast of Vietnam. It is located in Quang Nam province and is home to approximately 120,000 inhabitants. It is recognized as a World Heritage Site by UNESCO. Hoi An Ancient Town is an exceptionally well-preserved example of a South-East Asian trading port dating from the 15th to the 19th century. This description uses material from the Wikipedia article on Hoi An and is licensed under the Creative Commons Attribution-ShareAlike License (view authors).